Hey guys! Happy Monday! 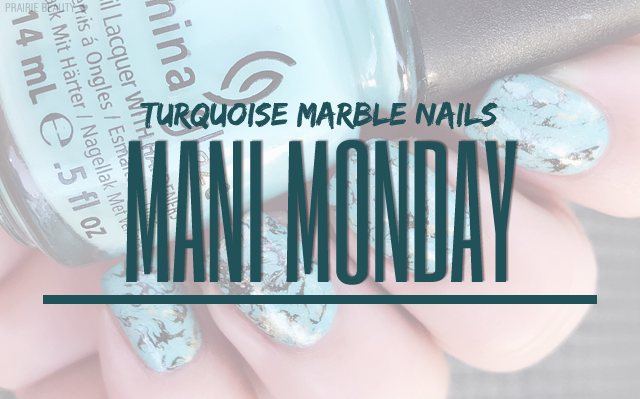 I'm still insanely busy, which is why content has been a little bit more sparse here on the blog, but I'm always excited to get my #CBBxManiMonday posts up! This week the theme was Gold Accents and I have to admit I was super excited about it, because it gave me an excuse to try a technique that I've been dying to try for quite some time. 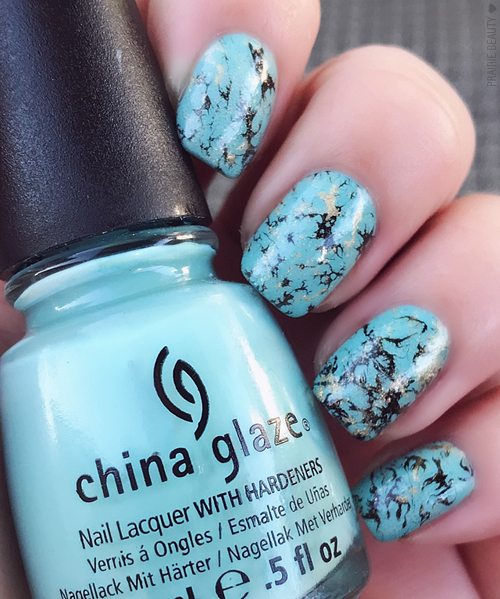 I've always absolutely loved turquoise - the stone more than the colour - and getting a mani that looks legitimately like turquoise has always appealed to me. What better time than now? Using water for nail art is not at all comfortable for me - but it tends to be worth the work for the final result. 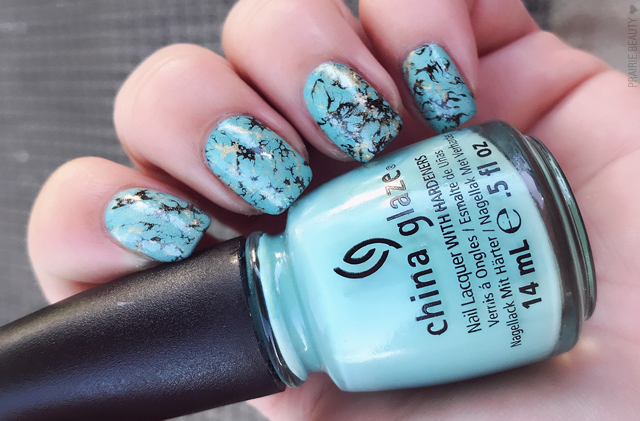 To get this look, I started with two coats of China Glaze For Audrey, which is always a favorite turquoise nail polish. Next, I added drops of Sinful Colors Black On Black to a small cup of room temperature water and let it spread to a thin layer before spritzing some hair spray into the cup to break it up. This was a little bit tricky because I was being very specific about how I wanted the marble to look, so I had to do at least a couple of times for each nail to get the look I wanted. I repeated the process with essie You're Golden to add the gold accents. I finished with a fairly thick coat of Cutex Quick Dry Top Coat and voila! It's somewhere between a bird's egg and a turquoise, but I love it either way! For more nail art featuring gold accents, head over to Cosmetic Proof, See The World In Pink, and Tea & Nail Polish to check out what they've got going for the Mani Monday this week!